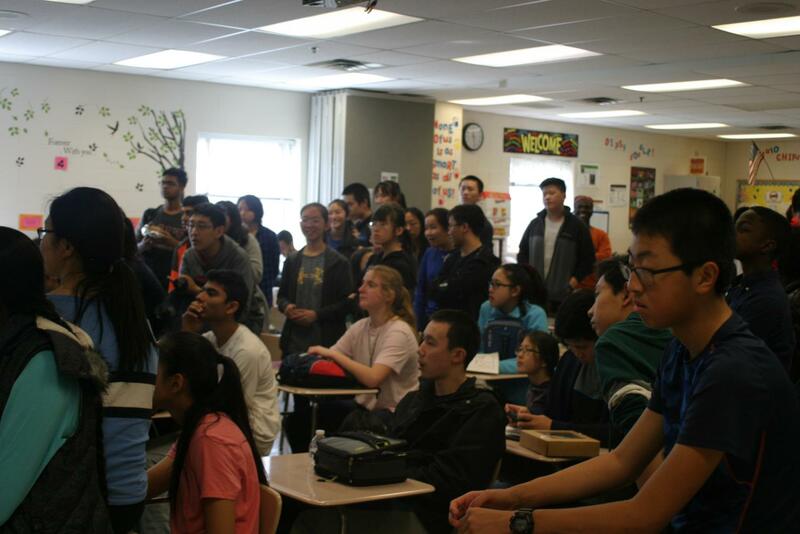 Students celebrate at the Pi Day Puzzle Hunt closing ceremony on March 15. On Monday, March 11, crowds of eager students gathered in Room 322 for the first puzzle to be released at the opening ceremony for RM’s fifth annual Pi Day Puzzle Hunt. Sponsored by RM’s Math Honor Society, the Pi Day Puzzle Hunt is a week-long event where students work together in teams of up to four to solve creative puzzles related to math. One puzzle in this year’s hunt, for example, asked participants to calculate the missing angles in a geometric figure, while another involved matching famous mathematicians with their achievements. Unlike its Mole Day counterpart, the Pi Day Puzzle Hunt also included additional Easter eggs called stars which teams could find hidden throughout the hunt. Acting as hunt organizers, seniors Lauren Zhou and Kevin Lu and juniors Jack Yang and Kush Savsani began preparing the puzzles in late December. “Working together, we decide where we want to hide things, any general thematic stuff we want to do, any big things like murals,” Lu said. Of the thirty eight teams who signed up this year, the πρ-maniacs were the first team to complete the hunt, solving all eight puzzles and the hunt’s special meta puzzle (which required the answers from all of the previous puzzles to solve) in a record-breaking three days. Comprised of seniors Daniel Lopez, Rithik Sebastian, Jeff Tran and Grant Yang, the team was also awarded the title of “Puzzle Hunting Superstars” for finding 17 of the 18 total possible stars in the hunt. “Our team was really successful because it’s our senior year of doing puzzles and we’ve had a lot of practice in the past doing puzzles hunts in and out of school,” Yang said. While a team of juniors was awarded for being the second team to finish the hunt, there was slight controversy over third place. Even though three teams raced to solve the meta puzzle minutes before the start of the Hunt’s closing ceremony, none of them were able to complete it in time. As a result, no third place award was handed out.and it was given to the writers. However, despite this controversy, the Hunt was ultimately very successful this year, garnering praise from many students for the puzzles’ difficulty and clever writing. “The puzzles were multi-dimensional, required a lot of in-depth thinking from a variety of different subjects, and most importantly, were difficult and fun to try to solve,” freshman Kevin Zhang said. Despite general praise and positive responses, many participants also still had small complaints for the puzzle writers. For example, some expressed discontent at how two consecutive puzzles were held by teachers, which allowed certain teams to expand their leads unfairly. “I think there were too many teachers, and also the sequence – so it would be like teacher, teacher, teacher or like online, online, online – and that would give some teams like a grand lead,” sophomore Luke Jones said. Lu noted that some teams stayed up late and even skipped classes to focus on the puzzle hunt and cited it as another indicator of the puzzles’ difficulty. “I think next year what this year’s writers will try to do is make the hunt a little bit easier and a little bit more accessible to everyone,” Lu said. As the hunt continues to improve, the hunt organizers urge more students to join in the fun and participate in the Hunt next year. “It was a week of a lot of fun, a lot of stress, but in the end, extremely fun and rewarding,” Lu said.